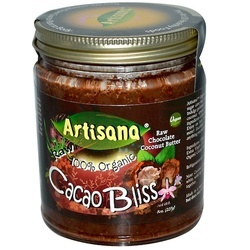 Artisana Organic Raw Cacao Bliss is a vegan and sugar cane-free spreadable nectar (when warmed). Indulge guiltlessly with our rich, creamy, chocolatey coconut spread made from pure organic raw ingredients of the highest quality.Artisana - The Art of Healthy Foods. Creating uniquely delicious, healthy, gourmet food is a work of passion for us. Using the most careful attention to detail and quality and handmade with care, our organic live foods are crafted using a special temperature controlled process that preserves the life-essential fatty acids, enzymes, vitamins and minerals.